DUBLIN, March 6, 2019 /PRNewswire-HISPANIC PR WIRE/ — Canada Life Reinsurance is pleased to announce that it has recently entered into a long-term longevity reinsurance agreement with VIVAT covering 70% of €8 billion of in-force liabilities. More than 150,000 of in-payment and deferred pensioners are reinsured by Canada Life Reinsurance under this agreement. Canada Life Reinsurance offers a range of innovative risk and capital management solutions covering mortality, longevity, health and lapse risks for insurers, reinsurers and pension funds across the U.S. and Europe, including the Netherlands, the U.K., France, Germany, Italy, Spain, Portugal, Sweden, Belgium and Ireland. VIVAT NV is the holding company for, among others, SRLEV NV, VIVAT Schadeverzekeringen NV, Proteq Levensverzekeringen NV, ACTIAM NV and Zwitserleven PPI NV. VIVAT’s subsidiaries are also active on the Dutch market with, among others, the Zwitserleven, Reaal and ACTIAM brands. A balance sheet total of €56 billion (end of December 2018) makes VIVAT one of the largest insurers in the Netherlands. Anbang Group Holdings Co. Ltd., a full subsidiary of Anbang Insurance Group Co. Ltd, is the sole shareholder of VIVAT NV. For more information please visit www.vivat.nl. Canada Life is part of a group of companies owned by Great-West Lifeco Inc., a diversified financial services holding company headquartered in Winnipeg, Canada. Great-West Lifeco and its insurance subsidiaries have received strong ratings from major rating agencies. To learn more, visit canadalifere.com. Great-West Lifeco is an international financial services holding company with interests in life insurance, health insurance, retirement and investment services, asset management and reinsurance businesses. Great-West Lifeco has operations in Canada, the United States and Europe through Great-West Life, London Life, Canada Life, Irish Life, Great-West Financial and Putnam Investments. Great-West Lifeco and its companies have approximately €0.9 trillion (C$1.4 trillion) in consolidated assets under administration as of December 31, 2018 and are members of the Power Financial Corporation group of companies. Great-West Lifeco trades on the Toronto Stock Exchange (TSX) under the ticker symbol GWO. To learn more, visit greatwestlifeco.com. 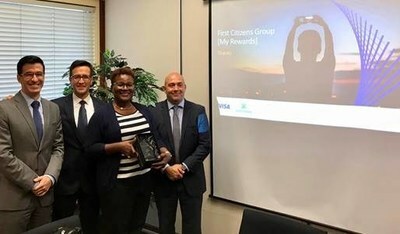 PORT OF SPAIN, Trinidad and Tobago, Feb. 22, 2019 /PRNewswire-HISPANIC PR WIRE/ – Trinidad-based First Citizens Group has received the Premium Partner designation from fintech and insurtech company novae and leading payment technology company Visa for being one of the first banks in the Caribbean to adopt Visa Loyalty Solutions (VLS), the white-label digital loyalty platform the two companies recently co-created. Over the years First Citizens has introduced a number of innovations locally, including Internet banking and mobile banking. It has also been recognized on several occasions for excellence in innovation, communications technology and e-commerce by the Energy Chamber of Trinidad and Tobago. VLS is a user-centric, universal, cross-border, all-digital, mobile-first, white-label loyalty platform for banks that enables consumers and merchants to redeem points anytime, anywhere, from any device (mobile, desktop or wearable) and using multiple payment methods (credit, debit, points or split payment), while offering banks superior customer care, same-day activation and easy administration. Thanks to VLS’s single, smart payment solution on an invisible and securely encrypted payment platform, First Citizens clients will be able to register rewards as digital currency that can be used alone or split with other payment methods, such as credit or debit cards registered on the platform, to make payments online and contactless in-store around the world. Finally, by integrating artificial intelligence and machine learning, VLS’s technologies will help First Citizens better analyze the interactions and purchase behaviors of its clients to present increasingly relevant offers, while retaining contact information, payment and travel preferences. novae not only created the technology behind the digital platform, but also the program’s impressive network of international travel rewards, to which First Citizens customers will now have access. A powerful metasearch engine and partnerships with major worldwide travel aggregators enable users to get preferential pricing and exclusive deals at more than 400,000 hotels in 25,000 cities; 70,000 flights to 1,700 destinations on 130 airlines; 500 car rental companies at 30,000 locations in 170 countries; 2 million vacation rental properties in 190 countries; and 10,000 tours and other entertainment options in 90 countries. First Citizens Group’s VLS Premier Partner designation is the latest of several awards and recognitions the bank has received. The bank was awarded the Best Bank in Trinidad and Tobago by Euromoney Award for Banking Excellence 2016 and also received an affirmed rating of BBB+/A-2 from Standard & Poor’s. Other awards bestowed on the bank over the years include Safest Bank in the English-speaking Caribbean in 2015, 2011 and 2010 (Global Finance Magazine); Best Bank In Trinidad & Tobago in 2015, 2014, 2012, 2010 and 2009 (World Finance); Bank Of The Year 2015 and 2009 (The Banker Magazine) and Bank of The Year in 2009 (Latin Finance). “First Citizens Group is proud to have received the Visa Loyalty Solutions Premium Partner designation, which recognizes our bank’s positioning as a first adopter of cutting-edge digital and mobile solutions,” said Avril Edwards, General Manager of Electronic Banking for First Citizens Group. “Visa Loyalty Solutions offers First Citizens a seamless and flexible digital experience that adds value and provides an unmatched customer experience,” said Ricardo Tafur, Vice President of Consumer Products for Visa in Latin America and the Caribbean. “VLS gives First Citizens an important differentiator in this competitive retail banking market,” said Jorge Lemus, SVP and Group Country Head, Caribbean and Central America for Visa. “As a pioneer in mobile and Internet banking, First Citizens has always offered customers cutting-edge solutions to meet their banking needs. With Visa Loyalty Solutions, they have added a powerful tool in their arsenal to maximize loyalty, boost spend and increase operational efficiency,” said Facundo Mendez, Managing Director of Enterprise, Growth and Loyalty for novae. HAMILTON, Bermuda, Nov. 1, 2016 /PRNewswire-HISPANIC PR WIRE/ — Ernst & Young Ltd. today announced two leadership changes. David Brown will become the firm’s Senior Partner in Bermuda and Insurance Leader for the EY Bahamas, Bermuda, British Virgin Islands and Cayman Islands region, replacing Pete Cangany, who will retire from EY after 37 years with the organization. This transition will take effect on July 1, 2017, and Cangany will remain in the role until that time. Effective immediately, Jessel Mendes will assume the new role of Regional Growth Markets Leader, in addition to his current responsibilities as Partner of Ernst & Young Ltd. (EY Bermuda). Brown most recently served as the Insurance Industry leader for the Southwest Region of Ernst & Young LLP in the US and directed the Southwest Region FSO Assurance practice. He has more than 27 years of experience working with large multinational clients, including insurance companies with global operations, US domestic insurance enterprises and Bermuda-based global reinsurance companies. Cangany has served as Senior Bermuda Partner since July 2014, and has been regional Insurance Leader since January 2013. In taking on the new role of Growth Markets Leader for the region, Jessel Mendes will be adding to his current responsibilities as EY Bermuda Partner. In addition to continuing to interact with EY Bermuda clients and other market stakeholders, as Growth Markets Leader he will focus on driving growth for EY firms across the region, maintaining a pulse on the market, overseeing the growth of EY service offerings, programs and initiatives, and determining how resources and capabilities can be best deployed to benefit clients. Mendes, who is a member of the board of the Bermuda Business Development Agency (BDA), will also leverage his extensive network of relationships to uncover new opportunities and help EY Bermuda and the region’s other firms build on their market position. This news release has been issued by Ernst & Young Ltd., Bermuda, a member of the global EY organization serving clients in Bermuda. Markel completes acquisition of assets of CATCo Investment Management Ltd.
RICHMOND, Virginia, LONDON and HAMILTON, Bermuda, Dec. 8, 2015 /PRNewswire-HISPANIC PR WIRE/ — Markel Corporation (”Markel”) (NYSE: MKL) and CATCo Investment Management Ltd. (”CATCo”) jointly announced today the completion of the acquisition by Markel of substantially all of the assets of CATCo. The business, which provides collateralized protections to over 35 global reinsurance buyers, will now operate as Markel CATCo Investment Management Ltd. (”Markel CATCo”). Every member of the CATCo team, led by Chief Executive Officer Tony Belisle, has transferred to Markel CATCo. Tony Belisle, Chief Executive Officer of Markel CATCo Investment Management Ltd., said, ”I am delighted with the successful closure of the transaction and the bringing together of two fantastic organisations that share similar goals and cultures. Willis Capital Markets & Advisory served as exclusive financial advisor and Hogan Lovells International LLP served as legal advisor to CATCo. Sidley Austin LLP served as legal advisor to Markel. Markel Corporation is a diverse financial holding company serving a variety of niche markets. The Company’s principal business markets and underwrites specialty insurance products. In each of the Company’s businesses, it seeks to provide quality products and excellent customer service so that it can be a market leader. The financial goals of the Company are to earn consistent underwriting and operating profits and superior investment returns to build shareholder value. Visit Markel Corporation on the web at www.markelcorp.com. About Markel CATCo Investment Management Ltd.
Markel CATCo Investment Management Ltd. is a specialist investment management business. From its headquarters in Hamilton, Bermuda, Markel CATCo manages retrocession and traditional reinsurance portfolios for clients around the world, including financial institutions, charities, pension funds, family offices and investment funds. Markel CATCo Investment Management Ltd. is authorized and regulated by the Bermuda Monetary Authority.